Making a homemade salad dressing is easy enough: just select some ingredients and shake it up. Except it is not so easy when all that oil and vinegar splashes to the floor due to improperly sealed containers. As much as cutting corners is a time-honored kitchen tradition, sometimes it just doesn’t make sense—especially when there are alternatives available. 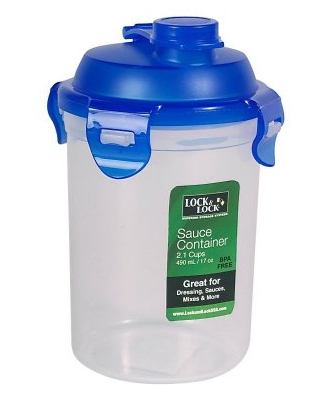 The Heritage Mint Lock & Lock Small Sauce is a 17-ounce container designed for easy (and safe) salad and sauce making. Featuring a 4-hinge locking lid system that effectively prevents accidental spills, the dishwasher, microwave and freezer safe container makes it easy to whip up homemade salad dressings—even for the most enthusiastic of shakers.